This is a site all about beans. Whether you call them snap beans, string beans or green beans, we want you to enjoy them from the ground up! All Hail Summer! It's grilling time. We have all the best recipes for cookouts, including how to grill hamburgers and steaks, marinades and side dishes. Ask the Green Bean Experts! Our recipes aren't limited to Green Beans! All of our easy to print recipes are tried and true, from trusted sources. Some of our recipes have valuable cooking tips! You'll find all our free recipes have an easy to print option. We hope that you'll enjoy these tried and true recipes, and that you'll check back with us often as we add to our recipe database. We have a wide variety of green bean recipes, from classics like Green Beans Almondine and Campbell's Green Bean Casserole, to new recipes such as Green Beans a'la Waterman's. We're proud of our variety of ethnic green bean recipes. Cook delicious Greek Green Beans, green beans slowly simmered with onions, garlic and tomatoes, or try the German recipe of Pears with Green Beans & Bacon, a fabulous sweet and sour recipe featuring fresh ripe pears. Enjoy Russian green beans in sour cream and tomato sauce or the Persian green bean and rice dish Lubia Polo. You'll be amazed how easy these recipes are. What is a Mezze? Get a great sampling of recipes and ideas for hosting your own Middle-Eastern Mezze. Try our delicious Moroccan Beef Stew, our flavorful and easy Orange Salmon with Fennel or Eggplant and Zucchini Gratin. Our delicious dessert recipes include a classic Red Velvet Cake with Buttercream Frosting as well as delightfully chocolately Black Bottom Cupcakes. Green Beans Have World Wide Appeal! Asian cooks add spices like garlic, ginger, scallions, chili paste and soy sauce to green beans. 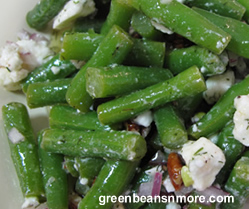 Greek green beans are simmered with onions, tomatoes, garlic and oregano until soft. Italian recipes for green beans are very similar to the Greek recipes. They call for stewed tomatoes, onion, garlic, basil and parmesan cheese. French love fresh young green beans. They call them "haricot verts" and cook them gently, using white wine, mushrooms, pearl onions and garlic. Some French recipes call for nothing more than the addition of fresh lemon and parsley. When you start off with the perfect ingredient less is actually more.